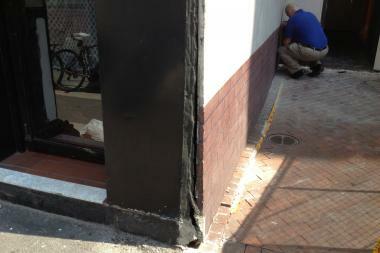 Officials are investigating cracks in a Second Avenue building that prompted its evacuation. UPPER EAST SIDE — An apartment building sitting directly across from the MTA's Second Avenue subway construction project had to be temporarily evacuated Wednesday after cracks were found in its facade, officials said. Tenants of 1830 Second Ave. were ordered out of their apartments at 10 a.m. Wednesday after building workers spotted a 1-inch-wide and 5-foot-tall crack running along the exterior corner seams near East 94th Street and notified city officials, according to witnesses and the FDNY. The building's super, Stacey Hadzibrahimi, blamed the damage on the Second Avenue subway under construction just feet from the front door. A future entrance to the new subway line is being built nearby as well. "One hundred percent, it's from the subway. You see lots of cracks," Hadzibrahimi said, pointing to others in the building's entryway. "My husband is scared — to tell you the truth — to come in the building because of all these cracks." Officials could not immediately confirm that the breaks were related to the new subway line. "We can't say whether it's a result of the construction," said fire chief Michael Massucci, adding that the Department of Buildings would investigate. Massucci said the building didn't pose an immediate hazard, and people were allowed back inside by 1 p.m. The Department of Buildings said the 5-story building, which holds a mix of 10 single and duplex apartments and a cellar and store on the first floor, was found to be structurally stable by inspectors on Wendesday. The apartment was currently being monitored, they said. An MTA spokesman said the stucco facade had partly separated from the side of the building and that people at the building believed the damage was new. "Our engineer and contractor are reviewing past inspection reports and instrumentation readings," the MTA spokesman said. "Initial reading review indicates there has been no recent lateral or vertical movement detected." Construction of the Second Avenue subway has consistently angered nearby residents. In August 2012, crews detonated explosives below East 72nd Street so powerful that they shattered windows, sent rocks flying and shook the sidewalk.